Cheesy corn fritters are the perfect summer side dish with fresh corn, cheddar cheese, green onions and jalapenos. To me, August always reminds me of corn. I remember driving through small towns and by cornfields on the way up north to the cottage where I would spend weeks during the summers. At the beginning of the summer, the fields would be high, but as we neared August, the first roadside corn stands would dot the two-lane highway. Eating a buttery cob of corn, sprinkled with salt is my first really significant food memory. I’ve always had a thing for salty, savoury foods. I think that’s why I’ve been drawn to good cheeses for as long as I can remember. 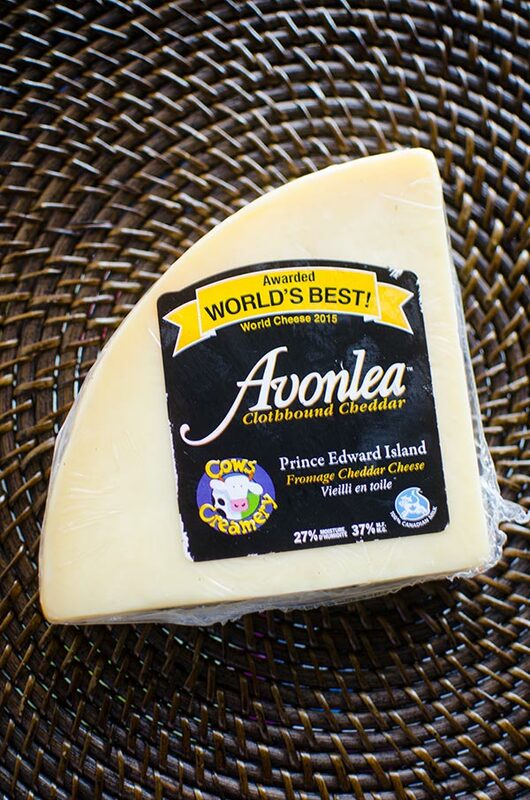 For this month’s Dairy Farmers of Canada Cheese of the Month Club, the featured cheese is Avonlea Clothbound Cheddar from Cows Creamery and it is the perfect pairing for sweet corn. As someone who is learning a ton about Canadian cheese, what I find fascinating about this particular cheese, which is different from our previous cheeses, is that it is the perfect representation of how the right environment can have a huge impact on flavour. This cheddar cheese comes from Cows Creamery in Prince Edward Island, and the natural salt air and iron-rich red soil are two of the major components that add to the full-bodied flavour. It’s kind of like tasting wine, once you have the flavour notes in the back of your mind, you notice them even more. I was recently talking about cornbread with a friend of mine (I know what you’re thinking, yes, we had a conversation about cornbread). He mentioned a new recipe for a cheesy cornbread he was making and that’s when I had that ‘a-ha!’ recipe moment, cheesy corn fritters. 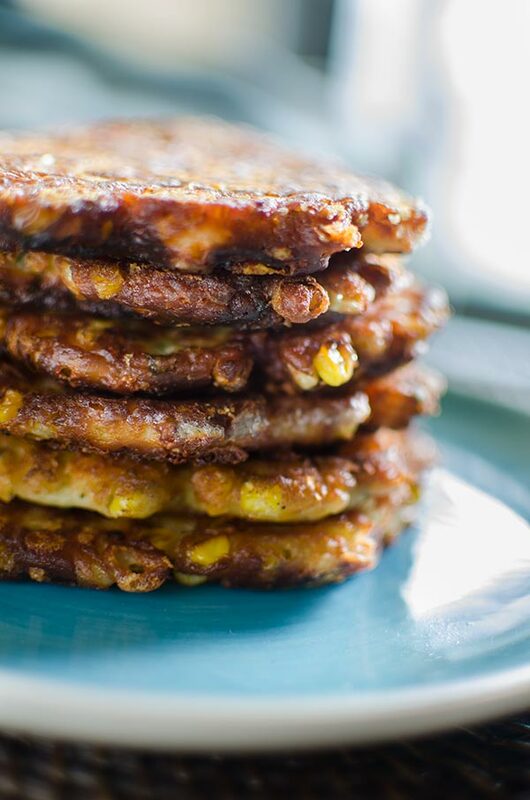 By adding grated cheese directly into the corn fritter batter, these fritters have a crisp bite on the outside and a distinct cheesy flavour. 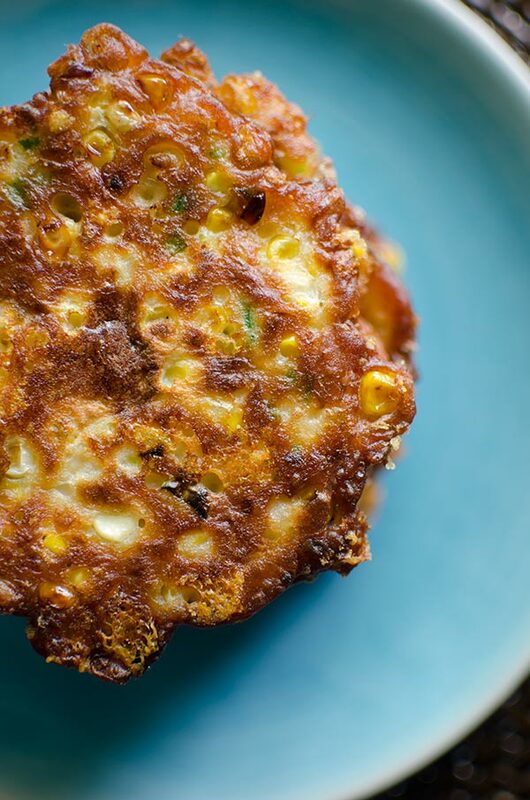 Paired with jalapenos and green onions, these cheesy corn fritters have become my new August favourite. There are a couple of secrets to frying delicious fritters, first is baking powder. I found that this helped the outside crisp up beautifully. The second tip is not to skimp on the oil, I always add about a ¼ cup in a large frying pan to start, and then watch the pan and add more as you see fit for the next batch. I found that if you add all the oil at the beginning, it ends up getting too hot for the second batch, and the fritters will burn on the outside before they are fully cooked through. In a large bowl, stir corn with cheddar, green onion, jalapeno, flour, baking powder and salt. Whisk in egg and milk. Add 4 tbsp of canola oil, when oil is almost at a ripple, spoon 1/4 cup portions of batter into pan. Spread the batter out with a spoon to form 3 inch fritters, turn heat down to medium and cook for 3-4 minutes per side. Remove fritters to a paper towel lined plate. Add remaining oil and repeat with remaining batter, you should have 6 fritters. Disclosure: This post was sponsored by Dairy Farmers of Canada – as always, all opinions are my own. Thank you for supporting my sponsors and allowing me to continue creating recipes like this recipe for cheesy corn fritters. I just wanted to say that your cheesy corn fritters look super delicious. I'm definitely going to try it tomorrow! Is it baking powder, or baking soda that's 2 tsp worth? Ingredients say baking powder, but the instructions mention baking soda, and I imagine it makes a difference.